Minister of Tourism and Cultural Affairs has urged African leaders to collaborate effectively and showcase their tourism potentials in order to foster socio-cultural cohesion among Africa countries. Madam Memunatu Pratt made the above call during the West African Integrated Travel dinner organised at the Novatel Hotel in the United Kingdom. She said that the tourism sector could be used as a platform to create huge opportunity for the country, adding that her ministry has embarked on a massive campaign to rebrand Sierra Leone through culture, tourism and trade. As part of the celebration, the Sierra Leone delegation participated in celebrating Sierra Leone National Day, inviting the Sierra Leone diaspora community based in the UK to contribute to the socio-economic development of the country. “Tourism in Sierra Leone is an important growing national service industry. Beaches and other natural habitats are the biggest parts of the nation’s tourism industry. 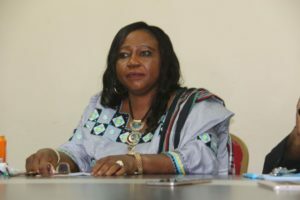 This forum has been created to sell Sierra Leone positively to the international community and it will also allow Sierra Leoneans to ask questions about the tourism sector as there are a lot of tourism potentials in the country,” she said and called on Sierra Leoneans in the UK and other parts of the world to promote the country’s culture.